Black Desert May 16 Game Update Patch Notes. Lahn Character Creation available now! Create your very own Lahn through our exquisite character creation. Don’t forget to subscribe to our newsletter and be enrolled to our sign-up event! Sign-up Event is held up until May 23rd maintenance. A character expansion slot will be sold at a discounted price during the class release event period. Click <Here> to hear the full story of Lahn and more! Create & Win! Lahn Pre-creation Event and Customization Contest! Create your unique Lahn customization, post it via [Beauty Album] in-game and have a chance to win the brand new Lahn outfit and more! Create and Receive rewards simply for creating Lahn! Your Lahn must not be deleted before the event ends as you will not be eligible to receive any participation rewards. Click <Here> to find out more about the Create & Win event! “Call of Moonlight Shard” Challenge has been added. During the event period, [Event] Moonlight Shard, which can be combined with a Memory Fragment through Alchemy, can be obtained from Challenges (Y) per one hour of playtime. Max 2 [Event] Moonlight Shards are obtainable per Family per day. Roses will be in bloom, and a crescent moon will shine over the night skies of BDO. Thanks to all your support and feedback, the event It’s Raining Enhancement will become a regular addition to the game. Continue to defeat monsters of each region and enjoy the chance to loot +15 gear (Main/Sub/Defense ger) as well as PRI or DUO accessories (earrings, rings, necklaces, belts) of Green and higher Grade. 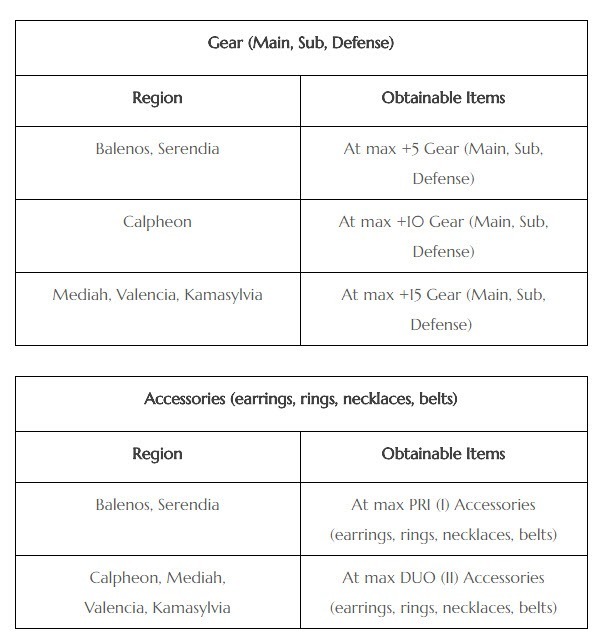 Enhanced gear can only be obtained by defeating normal monsters in the world and these gear items cannot be obtained from World, Field, or Bosses summoned from Boss scrolls. Fixed the issue where it was possible to attack and be attacked from inside and outside the castle Gate during Conquest Wars. However, cannon attacks can still inflict damage through the castle Gates. Construction Knowledge, a worker skill previously used for construction of node and conquest war towers, has been changed to Adept Worker. Obtained Construction Knowledge of the worker has changed as well. Fixed the issue where the alert message incorrectly referred to Nouver when Muraka and Quint were disappearing due to time out. Fixed the issue where HP was not recovered properly upon using Instant HP Potion when immobilized from CC attacks. Fixed the issue where the enemy Guild’s mounts could not be attacked before discovering the enemy’s fort. The distance a character moves when hit by Knockdown or Knockback has been reduced. There has been instances where, depending on internet connection, there was a discrepancy in how the game server and client registered the location of characters. This was especially noticeable when a character was hit by knockdown or knockback and got up rapidly. We have confirmed that if we reduced the distance the character moves in these situations, the fluidity of movement greatly improved. Only the first hit of a skill will now give CC effects (Knockdown, Floating, Bound, Knockback, Stiffness, Stun, Freeze). These effects will not be influenced by evasion. Until now it was inevitable that no matter how high your CC effect stats were you felt that they were not as effective as they should be. This was because CC effects were being repeatedly triggered for every hit from an attack skill. For example, if your Knockdown Resistance was 60%, and after five successful hits inflicted by the enemy which meant your Evasion failed every time, the effective resistance could fall as low as 7.7%. On the other hand, all Grapple skills had CC effects only applied once, at the first hit. Therefore, Grapple Resistance was applied as you would expect. This was a reason why there was a gap between those who played classes with mainly Grapple skills and those who didn’t. In the current system, if a character successfully evades an attack, then all damage related to CC effects will not be applied. Therefore, back when high accuracy was harder to get, if you had high evasion you could move around freely almost as if it was a bug, even when battling many opponents at once. To mitigate this situation, we have made all CC effects be visualized for each hit individually and have reduced the resistance chances. Therefore, when you are the attacker you should get a clear feedback on the attacks, which should a positive effect on improving the impact feel of the game. Even if the existing rules of evasion stats remain the same, as we have explained earlier, we predict that the efficiency will increase. Therefore, we are looking to change the rules of evasion. From now on, attack damage will only be affected in evasion stats, and CC effects will only be affected in CC resistance effects. That is, when a target is inflicted a hit, both damage and CC may be applied, only damage or CC may be applied, or none of the damage of CC may be applied. For those of you who worked to increase both CC resistance and evasion, we predict that you won’t feel a big difference from before. In addition, now when hit by the CC effect and additional attack effect (e.g. Down Smash) of the same skill, only one effect, suitable for that situation, will be applied. For example, when using Warrior’s Ground Smash on a standing enemy Bound effect will be applied but not Down Smash. If the enemy is down on the ground, Down Smash will be applied, not Bound and the word “Immune” will appear on the screen. Resource consumption has changed to Stamina consumption for Warrior’s skill Head Chase, Ranger’s skill Wind Step, and Kunoichi/Ninja’s skill Ghost Step. In addition, Stamina consumption for Musa/Maehwa’s skill Chase has been adjusted. Last week, all classes had defense effects (Forward Guard, Super Armor, Invincible) removed from some of their skills. It has become harder for melee classes to get through the attacks of ranged classes. To mitigate this issue, we have changed the defense effects or CC effects of some ranged attack skills and movement Main skills. Also, some skills that greatly influence large-scale PvP have been adjusted. Currently, the duration and damage of Black Spirit skills are different per class. To reduce the influence of the difference in such skills’ efficiency that affected class balance, we plan to adjust the damage of Black Spirit skills. In the process, some classes’ PvP damage will be lowered to some extent. Together with that change, the rules for for gaining Black Spirit’s Rage will be changed. Currently, every time you are attacked there will be a 50% chance of gaining 1%. You will also get 1% for each enemy defeated. We are planning on a new change which will make accumulating Black Spirit’s Rage slower, but in return, the skill will be applied with a special defense effect which will make your character gain the upper hand even when you are attacked with CC skills. We will be giving further details in future announcements. The AP of all summoned beings will be increased. This is to bring back relevance for summoned beings after all the class specs were increased in general and summoned beings became relatively weaker. On the May 9th balance patch, the defense effects from certain skills were removed. In response, many adventurers felt that this meant that PvP battles would end too fast. Therefore, in order to prolong PvP battles so you have more time to enjoy them, we plan to reduce the PVP damage of all classes by an identical rate. We are planning to add a new Black Spirit’s Rage Absorption (Common) The existing Black Spirit’s Rage Absorption skill will be maintained as each classes’ unique skill. The new Rage Absorption (Common) skill will increase AP and Attack/Casting Speed. You can chose which Rage Absorption skill you want in the Skill window (K) and lock the one you do not want to use. If you do not chose, the new Rage Absorption (Common) will be used by default. After internal testing, we have decided to that implementing the rule “One skill cannot have both a CC effect (Stiffness, Stun, Knockdown, etc.) and defense effect (Front Guard, Super Armor, Invincible) simultaneously” should be put on hold. This was because we have decided that this would make the game significantly harder. We will continue to test and brainstorm to bring you all a set of combat rules that would be enjoyable for you. We want to extend our thanks to all adventurers who have stood by us in the past 4 weeks of changes made to Black Desert Online. We will endeavor to create a much more enjoyable Black Desert Online and starting next week, we will focus on polishing on each class in a more sequential manner to elaborate the class balance in detail. The distance a character moves when hit by Knockdown or Knockback has been reduced and the motion became smoother. Fixed the issue where damage was not being applied properly for a specific period of time after Stiffness and Knockback motions. Forward Guard effect for the skill Frenzied Spear has been removed. Fixed the issue where the Warrior took on a kick motion even when there were not targets around while using the skill Charging Thrust. Resource consumption has been changed to Stamina for the skill Head Chase. Forward Guard effects for the skills Extreme: Charging Wind, Ultimate: Charging Wind, and Absolute: Charging Wind have been removed. Fixed the issue where Evasive Shot would not be activated upon using the skill Razor Wind if Ultimate: Evasive Shot was learned, and Evasive Shot will also be activated faster now. 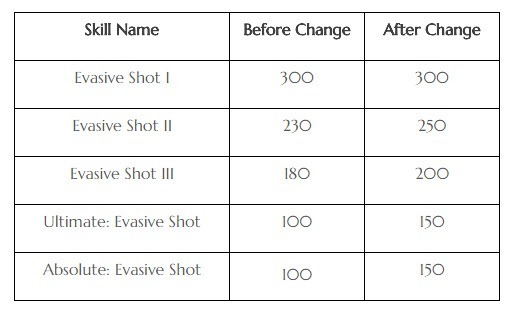 Damage reduction effect in PvE and PvP has been applied during cooldown of the skills Will of the Wind (A/D + F) I ~ V activated with Ultimate: Evasive Shot. 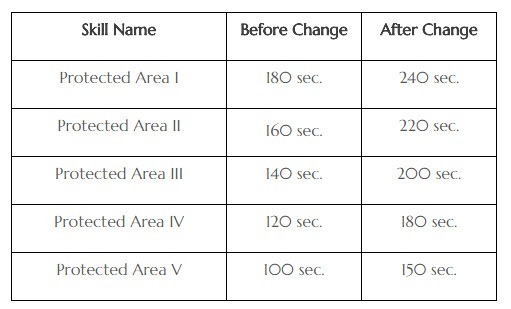 Damage reduction effect in PvE only has been applied during cooldown of the skill Absolute: Will of the Wind (A/D + F) activated with Ultimate: Evasive Shot. Super Armor effect for the skill Roaring Arrow has been removed. Invincible effect has been changed to Super Armor effect for the skill Flow: Call from Sky. Fixed the issue where the skill Blasting Gust would be activated after a successful hit of Pinpoint or Dash Kick even when Flow: Pinpointing Gust I and Flow: Pinpointing Gust II were not learned. Super Armor effect for all levels of the skill Blasting Gust has been removed. Damage Reduction effect has been added to the cooldown of the skill Absolute: Blasting Gust. Description of the skill Ultimate: Blasting Gust has been edited. Stamina consumption for the skill Evasive Shot has been changed. Stamina will no longer recover when the skill Nightmare is in effect. Stiffness effect will now be applied when the skill Dream of Doom is used instantly upon learning the skill Imminent Doom. Knockdown effect will now only be applied in PvE for the skill Abyssal Blow. Invincible effect has been changed to Super Armor effect for the skill Storming Crow. Stamina will no longer be recovered during the skill Darkness Released. 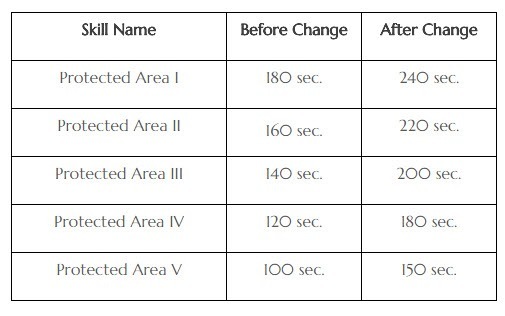 The following has changed for the skill Shake Off. Invincible effect has changed to Super Armor effect. Moving distance has increased when skill level goes up even in Iron Buster mode. Knockdown effect will only be applied in PvE now for the skill Flow: Shooting Mobility. The skill Ground Lifting will now activate at the same speed, not depending on the moving distance, after using the skill Lava Piercer. Fixed the graphical glitch in the arms of the Berserker upon equipping Kibelius Iron Buster and Bheg’s Gloves. The skill Rain Curtain will now be auto-activated when attacked while moving backwards in Celestial Bo Staff mode. Attack damage in PvP (against other classes) has decreased by 6.6%. Valkyrie and Warrior are the only classes that utilize the shield in Black Desert Online. With the advantage of wielding the shield, they are immune to all CC effects from all directions once they are on guard. Besides this advantage, Valkyrie has had an even greater increase in DP when on Forward Guard which makes her sturdier than the Warrior. Hence, her AP had to be adjusted by lowering damage in PvP only in order to balance the class out. Stamina will no longer be recovered during the skill motion of the skill Promptness. Stamina consumption has increased to 200 for the skill Promptness. Cooldown for the skill Celestial Cry has increased from 40 sec. to 60 sec. Super Armor for the skill Celestial Spear has been removed. Super Armor for the skill Celestial Smite has been removed. Cooldown for the skill Elion’s Blessing has increased from 150 sec. to 240 sec. PvP damage for the skill Absolute: Blizzard has decreased by 11%. Super Armor effect for the skill Sage’s Light has been removed. Cooldown for the skill Protected Area has been increased. Fixed the phenomenon where party members in non-combat mode went into hit motion when using the skill Protected Area. The Moving Speed, Attack Speed, Casting Speed reduction effect will be applied in longer intervals for the skill Blizzard. The debuff effect which used to be applied for each hit will only be applied when a certain motion effect during the skill is occuring. Damage of the skill Detonative Flow when inflicting hit on a target will be decreased by 5% per target, meaning the first target will receive full damage whereas the next targets would receive 5% less that of the previous target. This will only apply if the skill inflicts hit on more than 2 targets and the damage will be reduced down to 70% as the limit. For example, if 7 or more targets are inflicted hit, the first target would receive 100% of the damage, the second 95%, third 90%, fourth 85%, fifth 80%, sixth 75%, and seventh and next targets would receive 70% of the damage (Only in PvP). The text ‘Floating on good explosion hits’ has been removed from the skill description of the skill Fissure Wave. Cooldown of the skill Spellbound Heart has decreased. 600 sec. → 60 sec. Damage of the skills Water Sphere and Flow: Aqua Bomb when inflicting hit on a target will be decreased by 5% per target, meaning the first target will receive full damage whereas the next targets would receive 5% less that of the previous target. This will only apply if the skill inflicts hit on more than 2 targets and the damage will be reduced down to 70% as the limit. Stamina consumed has changed from 50 to 100 during cooldown of the skill Chase. The text ‘nullified during cooldown’ has been added to the skill description regarding Floating effect for the skill Spinner. Invincible effect has been changed to Forward Guard effect for the skills Blooming Stride and Blooming Step. Invincible effect has been changed to Super Armor effect for the skill Sleet Steps. Resource consumption has been changed to Stamina for the skill Ghost Step. It’s been adjusted that only Floating effect can be applied when performing the skill Ninjutsu: Block Jump in a combo using the left directional key whereas before, it was troublesome before as both Stiffness and Floating can be applied. Fixed the issue where Attack Speed +5% boost for 10 sec. for the skill Absolute: Ghost Greeting was not being applied properly. Fixed the issue where Stiffness effect did not take into effect intermittently when using the skill Murderous Intent. The skill description of the skill Seamless will now correctly show the actual effect taking into effect. The text “All effects of Fatal Blow, including damage, will be applied.” has been added to the description of the skill Flow: Fatal Blow Combo as the skill description was lacking in detail of the skill damage and effects. Bound effect of the skill Shadow Strike will only be applied in PvE now. ’Stiffness on good 1 hit(s)’ effect has been removed from the skill Unveiled Fate. Floating effect has been changed to Stiffness effect for the skill Seed of Catastrophe. Fixed the discrepancy in the actual damage inflicted with the skill description for Darkness Burst IV. Forward Guard effect has been added to the skill Ferocious Assault. Super Armor effect has been added to the skill Double Flash. Bound effect of the skill Ferocious Assault will take effect only in PvE now. Fixed the issue where the target inflicted successful Grapple hit from the skill Massive Suppression could stand right back up. Super Armor effect has been removed from the skill Rising Wolf Fang and Stiffness will be applied in PvP. Forward Guard effect has been removed from the skill Knee Hammer. Fixed the issue where the Striker struck a kick pose even when there were no targets around upon using the skill Charging Thrust. Forward Guard effect has been removed from the skill Elbow Edge. Laila’s Petal and Fairy Wing items can now be exchanged with the following items. However, this exchange will not be activated if ‘Laila’s Scattered Petals,’ or ‘[Repeat] Mysterious Companion’ quests are in progress. The item description for the following crystal items has changed where the ‘level increase’ are now labeled with ‘statistic increase’ for the following effects of the item. Maid registration (to Storage and Marketplace) has been changed. Before, the Maid could be placed only inside a residence but now, you can simply register the Maid with by right-clicking the maid contract. Maid contracts purchased before the update can also be registered with a right-click. The special talent of each Pet will now be displayed on their item descriptions. For details on newly added Pearl Shop Update, please click <Here> ! DP of monsters in Aakman Temple decreased by 3%. Monsters appearing in waves of Savage Rift will now appear with improved Evasion effect. The enhanced Evasion effect of the monsters will disappear 5 sec. after appearance. Voraro of Narc Brishka that spawns from Manshaum Narc’s Stone or Awakened Manshaum Chief Summon Scroll will not apply Knockdown to a character that approaches it during its constant jumping motion. The following has changed for Narc Brishka which summons from a Manshaum Narc’s Stone. Narc Briska’s HP was decreased by 10%. The constant jumping attack pattern of the Voraro that summons from Narc Brishka will be inflicted up to a maximum of twice. (Not the actual jumping motion but the attack pattern frequency decreased). The Voraro that summons from Narc Brishka will no longer Knockback characters nearby. Fixed the issue where characters could bypass the protective shield created by Narc Brishka. Some of the attacks of the following monsters will no longer inflict a debuff. Aakman Illusion Trap has been adjusted to apply Stiffness instead of Knockdown in its attacks now. The movement of the Goblin Worker escapee in the quest ‘Why Did the Goblins Run Away?’ has been made more natural now. When using Recharge Alchemy Stone, the amount needed to recharge can now be previewed upon registering the materials. When climbing on a Wooden Fence, only the Wooden Fence’s Durability will appear now. It’s been fixed that only the HP of the Wooden Fence would show up right above the character’s HP bar when climbing on top of the Wooden Fence. Fixed the issue where a misleading message stating ‘Guild Bonus can only be claimed when a region is occupied’ would be shown when a character not registered to a guild pressed Hotkey (G). Fixed the intermittent client crashing issue when passing by buildings. Fixed the issue where a character would get stuck in between structures in Hystria Ruins. Fixed the issue where Grapple was not being applied properly to monsters. Fixed the issue where certain Fairy skills like Feathery Steps would not work properly when Processing began. Fixed the issue where more than 3 skills could be applied to Skill Enhancement using Skill Reset. Fixed the intermittent issue where Guild Bonus was not being distributed properly in Extra Large guilds. Fixed the issue where desert merchant NPCs could be attacked by summoned creatures even when Force PvP mode was off. We are aware that the text of Super Armor appears for the skill Rising Wolf Fang of the Striker and working on a fix.